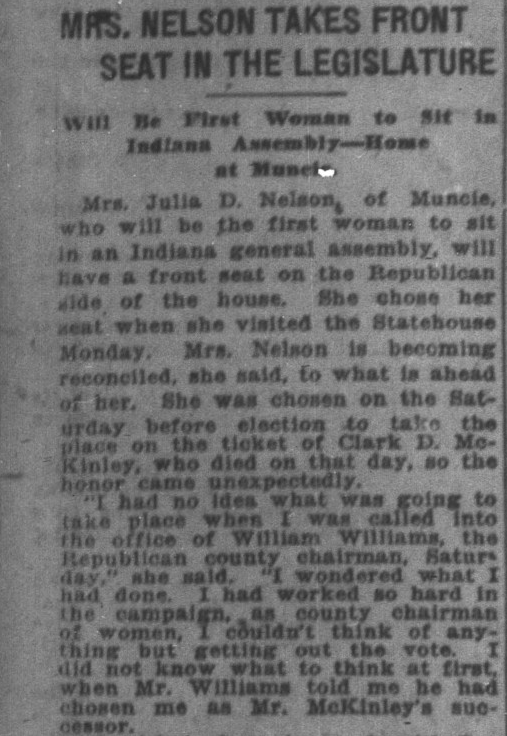 Julia Nelson (R-Delaware County) never set out to be the first woman elected to the Indiana General Assembly. 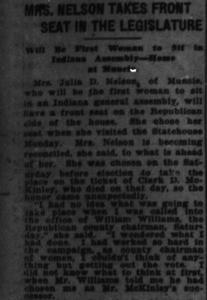 A long-time suffragette, Nelson was 56 years old in 1920 when women first got the right to vote in Indiana. She chaired the Delaware County Republican Women’s Club that year in order to encourage women to utilize their new right (and to encourage them to vote Republican when they did). And then, on Saturday, October 30, 1920—just days before the November 2 election—incumbent State Representative J. Clark McKinley (R-Delaware County) suddenly died. Local Republican leaders quickly made the decision to reward Nelson’s efforts by running her in McKinley’s place, and by that evening she was officially a candidate for office. Barely 72 hours later, they were celebrating the accomplishment of sending the first woman to the General Assembly. Since Nelson’s service, there has been at least one woman in every session of the General Assembly. As the 2018 elections capped the first century of women in legislative office, perhaps it’s fitting that some characterized this year as a sort of Pink Wave. By the numbers, at least, the Pink Wave seems to have crested a little higher than the anticipated Blue Wave. While Democrats netted a four-seat gain in state legislative races, women netted five. The result is nine new female legislators, and 35 total between both chambers—an all-time record. As the following chart shows, progress has indeed been a sort of slow-rolling train—but one that’s built quite a head of steam in recent years. Nelson only served a single term, but was replaced in 1922 by Elizabeth Rainey (R-Marion County), who many consider the first woman to win a general election for a state legislative seat. Nelson also served just a single term, but was followed by two more women in the House in 1924; two more in 1926; and three in 1928. In the 1930’s, no session ever featured more than one woman in the House—and more often than not it was Bess Robbins Kaufman (D-Marion County), the first woman to serve more than one term (she won election in 1932, 1936, and 1938). While women constituted a very small minority of elected members of the House throughout the 1920’s and 1930’s, the onset of World War II saw them make progress in terms of their numbers as many men went off to war. In 1942, a then-record six women were elected—including Arcada Balz (R-Marion County), the first woman elected to the Senate. Balz won a special election that year to replace Sen. Edward Green (R-Marion County) after he resigned to serve in the U.S. Navy. She won a full term of her own in 1944, making her the first to serve multiple Senate terms also. It wasn’t until 1964 that a woman was elected to serve in both chambers, when Marie Lauck (D-Marion County) was elected to the Senate after having been elected to a single term in the House in 1958. Lauck’s feat wouldn’t be repeated until Julia Carson (D-Marion County), who was the first African-American woman elected to the House in 1972, and the first African-American woman elected to the Senate in 1976 (a distinction she shares with Katie Hall, D-Lake County, was also elected to the Senate that year; both Hall and Carson would go on to be elected to the U.S. House, with Hall being the first African-American of either gender elected to the U.S. House from Indiana). Carson’s election to the House in 1972 also coincided with the first year in which women reached a double-digit number of members (10 total; 7 in the House, and 3 in the Senate). 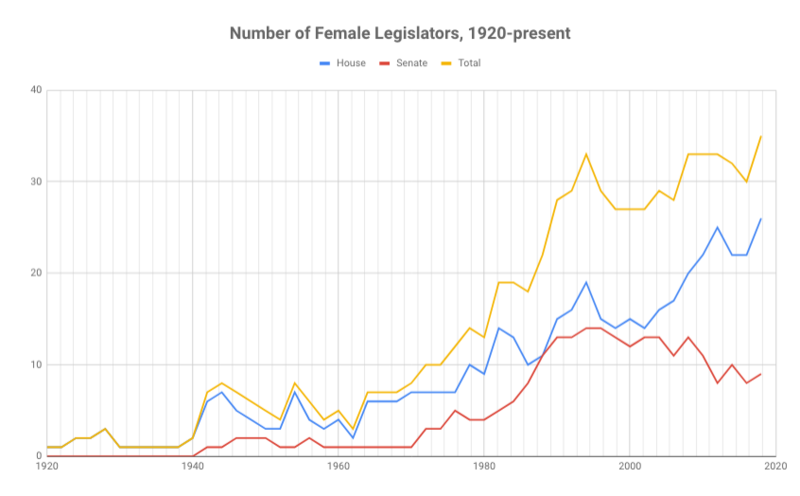 Since then, there have always been a double-digit number of female legislators; additionally, since 1988 there have been at least 20 (the first year they hit that plateau); and since 2008 there have been at least 30 (there were 33 elected in 1994, the only year prior to 2008 in which there were more than 30). 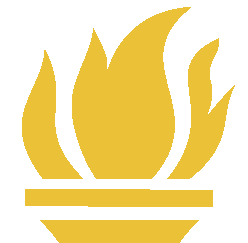 This progress culminates at the start of the 121st General Assembly, which will feature 35 women at its start. That bests the previously record of 33 who served in the 109th (1994-1996), 116th, 117th, and 118th (2008-2014) General Assemblies. The House will see 26 women on the floor this session, setting a record for that body that just ticks past the 25 that served in the 118th (2012 to 2014). The other 9 will serve in the Senate, down from the record of 14 that served in that body in the 109th and 110th (1994-1998), and the 13 that served in the 116th (2008-2010). It’s worth noting that the average General Assembly from 1990 to 2010 saw 13 female Senators and 16 female Representatives; since 2010, the number of Representatives has grown to an average of 23 (an increase of 43%), but the number of female Senators has dropped to an average of 9 (a decrease of 30%). But while the number of women serving in the legislature continues to steadily grow, the number of women who have served in legislative leadership posts has been slow to catch up. While four women have served as the nominal presiding officer of the Senate by virtue of being the Lt. Governor (Kathy Davis, Becky Skillman, Sue Ellspermann, and Suzanne Crouch), no woman has ever served as Senate President Pro Tempore or Speaker of the House. Meanwhile, Sen. Vi Simpson (D-Monroe County) is the only woman to ever serve as Minority Leader—the highest ranking post for the minority party—in either chamber during a legislative session. The only other woman to head a legislative caucus is Rep. Linda Lawson (D-Lake County). As some may recall, she served as the House Minority Leader for about four months in the interim period of 2012 after Democrats ousted Pat Bauer (D-St. Joseph County) in a surprise July caucus held in West Lafayette; but she only agreed to hold the position until just after that November’s election. Going down the ranks gets a little tougher, both because the records aren’t easy to find, and also because there are a seemingly endless number of “assistant” and “deputy” titles that get handed out in the process of coalition building around leadership elections. In the interests of space and time, I’ll focus just on the positions of Floor Leader (or Assistant Floor Leader in the Senate Democratic Caucus) and Caucus Chair, as they are the traditional #2 and #3 spots in each caucus. It appears that only eleven women have ever held these ranks, and all since 2000 (please let me know if you see any omissions). This session, there will be four women serving in the top twelve spots. This seems on par with recent history, as there have always been between three and five women in those spots since 2006 (2010-2012 was the only period with 5, when Simpson, C. Lawson, L. Lawson, Sipes, and Richardson were all in top leadership roles). But this will be the first session since women broke into these roles that Republicans won’t count one among their leaders; and this leveling off has also occurred even while the number of women in legislative offices has increased 25% since 2006. Regardless, as women begin their second century of elected service to the state, they do so with continually increasing numbers and influence around the State House. Consider: The women serving in the 121st General Assembly make up 21% of all the women who have ever served, and 75% of all women legislators in history (123 out of 164) have served since the start of the 112th (November 8, 2000 and after). Even for a slow-rolling train, that’s quite a bit of momentum.